The creator of the highly controversial breast milk ice cream is at it again. Matt O’Connor, the IceCreamists owner, has created a concoction that includes holy water, absinthe and sugar. He calls this the Vice Lolly. The holy water used in this uniquely flavored ice cream was purchased from Lourdes, France. Lourdes is a Holy city declared by the Catholic Church after a 14-year-old girl claimed to have seen a vision of the Virgin Mary. The ingredient absinthe can speak for itself; literally for some folks who consume it. 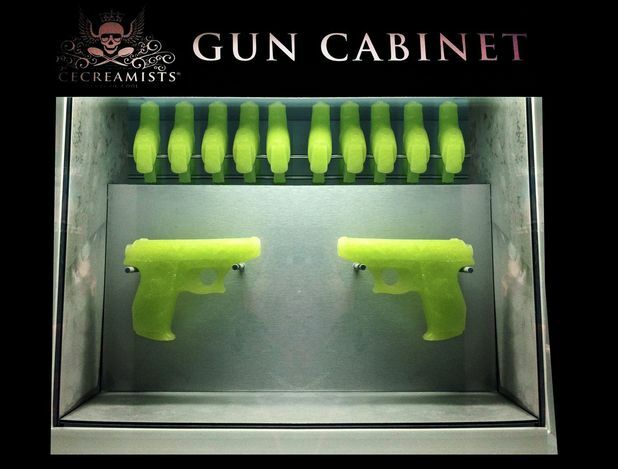 The absinthe gives the gun-shaped ice cream its green color. The Vice Lolly is being sold for £18.58 ( 28.47 US Dollars) and is only available at the Icecreamist shop in London. While the creator said he wanted to make a strong statement about religion because he grew up in a Catholic church, I’d really like to know his exact reasoning for choosing the shape of a gun. I think making the ice cream in the shape of a nun or priest would have a strong statement about religion just as equally. I’m also wondering if by consuming this holy water ice cream, will the blessings process be altered in any fashion? IJS. Check out this video for more information on the Vice Lolly. Posted on Fri.Jun.01.2012, in News & Opinion and tagged absinthe, catholic, green, gun-shaped, holy water, ice cream, ice lolly, icecreamists, Lourdes, Virgin-Mary. Bookmark the permalink. Leave a comment.